Published: Aug. 31, 2014 at 12:03 p.m. 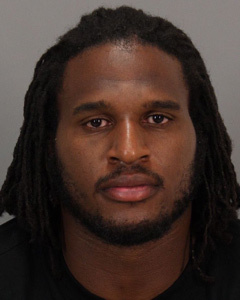 Updated: Sept. 1, 2014 at 01:26 a.m.
San Francisco 49ers defensive end Ray McDonald was arrested early Sunday morning on felony domestic violence charges. McDonald was arrested and booked into Santa Clara County Jail after officers responded to a domestic violence incident, according to documents obtained by NFL Media from the San Jose Police Department. McDonald posted bail and was released from Santa Clara County Jail on Sunday. He is set to appear in court on Sept. 15, according to CSN Bay Area. The Sacramento Bee reported that police arrived at McDonald's home at approximately 2 a.m., where a party was being held in honor of McDonald's birthday. McDonald appeared to have an altercation with his fiancee, who showed police bruising on her body. McDonald was then taken into custody. Other Niners players were in attendance at the party, according to the report. McDonald's arrest could eventually lead to an extended absence from the Niners. Last week, NFL Commissioner Roger Goodell announced a significant change to the league's Personal Conduct Policy in regard to domestic violence. There is now a mandatory six-game suspension for a first domestic violence offense and banishment from the league for a second offense, with the possibility to petition for reinstatement after a year. McDonald has a previous arrest, in 2010, for driving under the influence, according to the San Francisco Chronicle. "The 49ers organization is aware of the recent reports regarding Ray McDonald and we take such matters seriously," said 49ers general manager Trent Baalke in a statement. "As we continue to gather the facts, we will reserve further comment." The arrest comes two days after McDonald reportedly restructured his contract with the Niners. The run-stuffing defensive end has been a productive starter in Jim Harbaugh's 3-4 scheme over the past three seasons. San Francisco's front seven took a big hit last week when Aldon Smith was handed a nine-game suspension for violating the league's policy on personal conduct and substances of abuse. Now it's McDonald who could be in line for substantial league discipline.